The media industry is taking a major leap towards an IP-centric future as growing market demand converges with rapid acceleration in standards, protocol and interoperability. 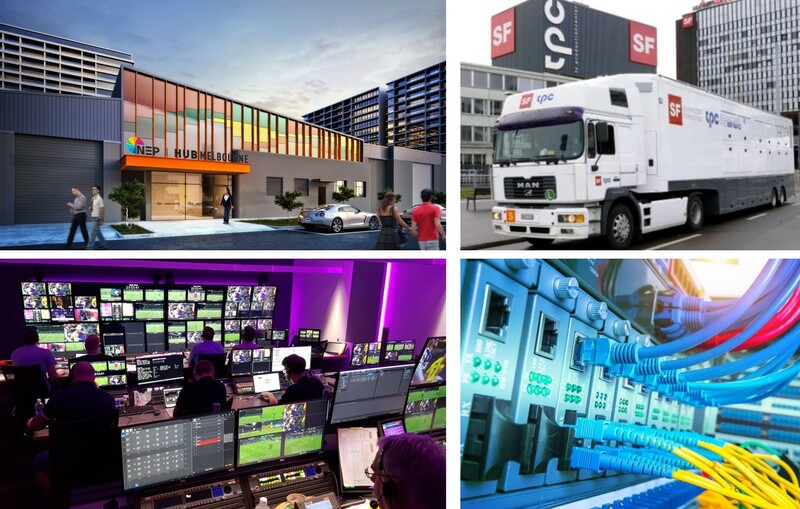 In the past 12 months alone, industry powerhouses the BBC, TPC, TV Globo, Sky Perfect, JSAT Corporation, NEP Australia and CCTV have joined an already impressive raft of global broadcasters and facilities companies migrating to and reaping the benefits of an IP-enabled operation. Get the actual picture in 18 Days at this years NAB Show: This vast and comprehensive show floor showcases the latest game-changing tech, craft-altering trends and cutting-edge tools that change how we create, manage, deliver, consume and monetize content, no matter the purpose, no matter the screen. As of today we feature 38 companies and their approach at the NAB2018 Show. This list is continously updated. NAB2018 opens on 07April at the Las Vegas Convention Center. The link "NAB2018" will always show you the list of featured companies and events in alphabetical order. When the highly-prized broadcast rights for horse racing on British television recently switched channels, outside broadcasting specialist NEP Group seized the opportunity to create one of the UK’s most advanced OB trucks. Named Equinox, the truck is capable of meeting every requirement for the live broadcast of race meets, without additional support. At the heart of its technical infrastructure is a Sony video mixer, a Calrec audio mixer, a Platinum IP3 router and a RTS ADAM intercom with OMNEO IP technology. With Equinox now on the road and more NEP trucks being designed NEP is exploring the further possibilities of OMNEO. Televideo deliver the highest standard of outside broadcasting to a worldwide client base, always with a friendly and professional attitude. Televideo has many long-term clients for whom they work on a regular basis, such as Sky Sports, the BBC, The Perform Group, Eurosport, Boxnation and Premier Sports to name a few. Televideo also act as host broadcaster on a range of major stand-alone events, recent credits of this type include the England v Kazakhstan World Cup qualifier, the Rugby League World Cup, the ISU World Speed Skating Championships and the FINA Diving World Series. The outside broadcast units are regularly upgraded to allow the company to remain at the cutting edge of outside broadcasting. Televideo have recently launched HD8. Slomo.tv, a leading international producer of cost-effective, high performance server-based video recording and replay systems, has announced the successful completion of a project that sees the installation of two Dominator AT/3G production servers at the Moscow broadcaster TV Center. The servers have been installed and commissioned in the center’s main Outside Broadcast (OB) vehicle, where they replace two EVS LSM XT2 servers. The server installation is a key element of a major upgrade of the OB truck, enabling it to process a diversity of new video and data formats, such as 3G as well as continuing to support legacy formats. Before anything else, news production starts with image capture, wherever and whenever breaking news takes place. Now, WAPA TV can make full use of the powerful features of the LDX Compact Series through RS-LDX integrated robotic cameras. The cameras enable complete customization in one easy-to-use package, right out of the box, with BT.2020 wide color gamut support, as well as optional native HDR support using SMPTE ST 2084 and HLG. While the RS-LDX captures community news and events in the field, Ignite Konnect, with full integration of Karrera switchers with Ignite Production Automation, allows a single operator to manage control room devices used to produce live newscasts and event programming. The System T installation consists of a large, three-bay, 48-fader S500 control surface, redundant T80 Tempest Audio Engines, plus SSL Network I/O stageboxes and SDI bridges. One particular aspect of System T that appealed to Videotime was its control interface; specifically, the flexible nature of control across the S500 surface suits Studio 10's busy production schedule. TrickboxLive allows users of the platform to include both online pre-registered participants and a live studio audience from the business community. The panel of industry experts discuss key issues moderated by a professional broadcast presenter or presenter chosen by the client, who maintains a fast paced and engaging conversation - akin to a talk show - between both the panellists and the audience who watch and participate via their mobile or desktop. Participants use TrickboxLive's sophisticated video and audio applications to vote in polls, submit questions and interact via social media channels. As well as delivering a lively interactive debate with broadcast quality streaming, the company hosting the session also captures advanced data analytics and programmatic and rich media advertising. LiveU’s LU600 HEVC portable transmission solution was chosen by the organisers due to its superior video quality and reliability. The LU600 HEVC units will be used on e-bikes (electric bikes) connected to GoPro cameras along the route, motorbikes and in helicopters together with LiveU’s Xtender remote transmission device. LiveU’s servers will be installed in OB trucks with direct connectivity to the Internet in the race villages, thanks to the race’s headline sponsor and technology partner, Dimension Data. LiveU will also provide behind-the-scenes coverage in the village, for example interviews with the cyclists. Top professional and amateur mountain bikers from around the world come together every year and compete in teams of two. Participants include successful athletes and sports people from different fields, such as Formula1, motorcross, rugby, cricket and Ironman. Texas A&M basketball fans are getting a fresh perspective of each game this season, courtesy of five new AJA RovoCam UltraHD/HD HDBaseT cameras installed throughout Reed Arena. The compact block cameras capture in-stadium footage of athletes and fans, which is displayed on a 54’ x 24’ video board, one of the largest among NCAA Division 1 schools. 12th Man Productions, the university’s athletics video production arm, is responsible for both the live video board broadcast and a live stream of each game to a popular sports network’s digital app. Led by Director of Broadcast Technology Jesse Janosky, 12th Man Productions initially explored a few camera options to boost in-game content for fans on its new video board. The show, which aims to find new singing talent, ran from October 2017 to February 2018 and was won by Amaia Romero. Along with fellow contestant Alfred Garcia, she will now represent Spain in the Eurovision Song Contest in May. The choice of microphone was crucial to the success of this programme because RTVE wanted to return the show to its original live format. This meant capturing the atmosphere of a Gala concert by having contestants sing in front of a live audience each week, on a stage with monitors and a large format PA. Given that these were inexperienced performers, it was vital that the microphone used could deliver clear natural sound, high separation and extreme sound level handling. The halftime event at the Super Bowl is an annual cultural benchmark, and the Pepsi Super Bowl LII Halftime Show that took place on February 4, 2018, at U.S. Bank Stadium in Minneapolis saw featured performer and GRAMMY® winner Justin Timberlake zoom through a medley of 11 songs supported by scores of singers, dancers and even the University of Minnesota Marching Band. It was a big show, and the sound was held together through an extensive Dante™ networked audio infrastructure featuring components from Focusrite’s RedNet range of Dante-networked audio converters and interfaces. The fourth season of the top-rated ‘Your Face Sounds Familiar’ franchise in Slovenia was produced by POP TV and featured eight celebrities engaging in a series of singing impersonations – taking off local and international artists - over 12 episodes, which was voted on by a combination of judges and the public, with the public having the final say on the winner. It was lit by Ziga Krajnc who worked closely with Matjia Kacin who designed a scheme of LED strips and panel products closely related to the set, and scenic designer Milan Vukadin. Ziga this year chose Robe moving lights as the main fixtures on a dynamic rig, including BMFL Blades, Spiiders, LEDWash 1200s, Pointes and LEDBeam 100s, around 80 in total, which were supplied to the production by Event Lighting, Slovenia’s largest rental company. For the production of prime-time TV-programs in a theatre at the famous Gran Via in Madrid, the company was looking for a wireless intercom system with the best audio quality on the market and the best field coverage possible. After extensive market research, they opted for the LaON LT750 system together with 16 belt packs. Using the LT750 system with only one repeater, Drago can cover the complete theatre with all team members having an uninterrupted connection to all 16 belt packs. Working in the 5 GHz UNII Band all LaON systems guarantee system stability even in large contested site environments or contorted buildings, like theatres. All of Saarländischer Rundfunk’s radio live broadcasts and concert recordings originate in Studio Eins – the broadcaster’s so-called Event Studio. In addition to podium discussions, the studio hosts jazz and French chansons, as well as regular radio concerts and unplugged sessions with artists currently in the charts. These productions are used for radio broadcast and CD releases – mainly jazz duos and big bands, but also regional music ensembles. In addition, mobile productions and external concert recordings are edited in Studio Eins. Integrated via RAVENNA technology, the new mc²96 Grand Production Console was delivered in mid-December 2017.